Diamond Drill Bits, are also know as a Diamond Core Drill Bit, Diamond Hole Saw or Bonded Diamond Drill Bit. They are often thought of as a Glass Drill Bit or Tile Drill Bit, but a Diamond Tip Drill Bit is much more versatile since they are used to drill glass, ceramics, porcelain, ceramic tile, porcelain tile, limestone, slate, marble, granite, light stone, and fiberglass. Water is required for lubrication when drilling. on the new type of super-hard floor, counter and wall tiles. Diamond Drill Bits are the solution. Hole Saw style drill bits have a hollow center and cut a circle in the material to create a hole. This results in a hole the size of the bit and a smaller "plug" or "core" which comes from the center. They are sometimes referred to as Diamond Core Drill Bits, however, technically core drill bit sizes relate to the size of the core, not the hole size. 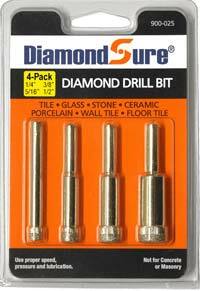 The Diamond Drill Bits are available below in sizes from 5/64" to 5-1/2" (outside diameter). The metric manufactured size of each bit is also shown below (mm), along with the exact inch measurement of each of the bits. <Click Here> Diamond tip drill bits are easy to use, however, there are many special techniques which are different from standard steel-bit drilling. Diamond drill bit usage can also vary depending upon the type and the specific manufacturer. To assist our customers, we have compiled a detailed Drilling Tips & Techniques section. SPEED KILLS: Reduced drill speeds, low drill pressure and increased use of water lubrication will extend drill bit life considerably. Because diamond drill bits are used to drill in extremely hard materials, it is very important to use proper drill pressure to keep from overheating the bit. Excessive pressure is merely converted to heat energy and can burn up a bit very quickly. * WARNING: Drill press arm leverages hand pressure by a factor of about 6 to 8. So 2 lbs. of hand pressure on the drill press arm will apply about 14 lbs of pressure to the drill head. All diamond core drill bits have shaft sizes of 3/8" or less, for use in standard drills. For detailed drill bit size information (total length, shaft length and bell length) - See Diamond Drill Bit - Size Chart. vary significantly depending upon the material being drilled. or for depths beyond about 1/2"
35% Off Individual Bits Purchased Separately! For drilling glass, stained glass, china plates & fiberglass! Blunt Nose Diamond Tip Drill Bits work with any drill - just add water for lubrication. Glastar brand drill bits are much easier and safer to use than old-fashioned spear point steel drills and don't chip the work material. Blunt Nose Diamond Drill Bits are primarily a Glass Drill Bit, for use on glass, stained glass, china plates or fiberglass. These solid point bits are not designed as a Tile Drill Bit and should not be used for drilling porcelain tile, floor tile, limestone, slate, marble, granite or other stones. Glastar Blunt Nose Drill Bits are designed to be used at high speeds up to 10,000 rpm. Since Glastar Diamond Tip Drill Bits have a solid rounded tip, they are slightly easier to start when drilling on a curved surface, such as a bottle, when compared to using a Core drill bit, above. 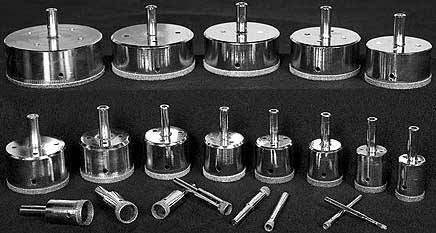 However, since solid tip drill bits drill out the complete hole, they also drill more slowly than the hollow core style bits and they are generally not used on the super hard abrasive materials such as ceramic or porcelain tile, floor tile, limestone, slate, marble, granite or other stones. Hollow core style drill bits are recommended for drilling in these very hard materials and are available from 1/8" to 4" in the section, above. See also Diamond Core Drill Bits and How to Use Diamond Drill Bits. shown in lower left of picture. Diamond coated file is 7" long with "half-circle" shaft. A perfect general purpose file for use on flat, rounded or curved edges. Use on glass, stained glass, ceramic, marble, stone, fiberglass or plastic. Blade of file is 3/8" wide, tapering to a point. Perfect for filing off sharp edges, reshaping cuts or reaming drilled holes. Handle is vinyl coated for safety and comfort.